Congratulations! You have made your first move in making the right remote control car purchase. With so much choice available they come in different sizes and styles, from F1, rally, stunt cars, Traxxas trucks and even tanks. There are many choices out there whether you are on a budget, looking at power/speed, range and battery life. But above all else the general experience and enjoyment is a must. After all, why bother if the car is just not exciting to use. Cars create enjoyment and passion at all ages and this should be no different with your kid. So let’s have a look at the products available and which suits your 8 to 11-year-old. Price – The obvious one is considering what you are actually prepared to pay. Are you after a cheap basic RC vehicle, a top of the range or a balance between the two. The more you spend the more features is provided and generally better quality overall. 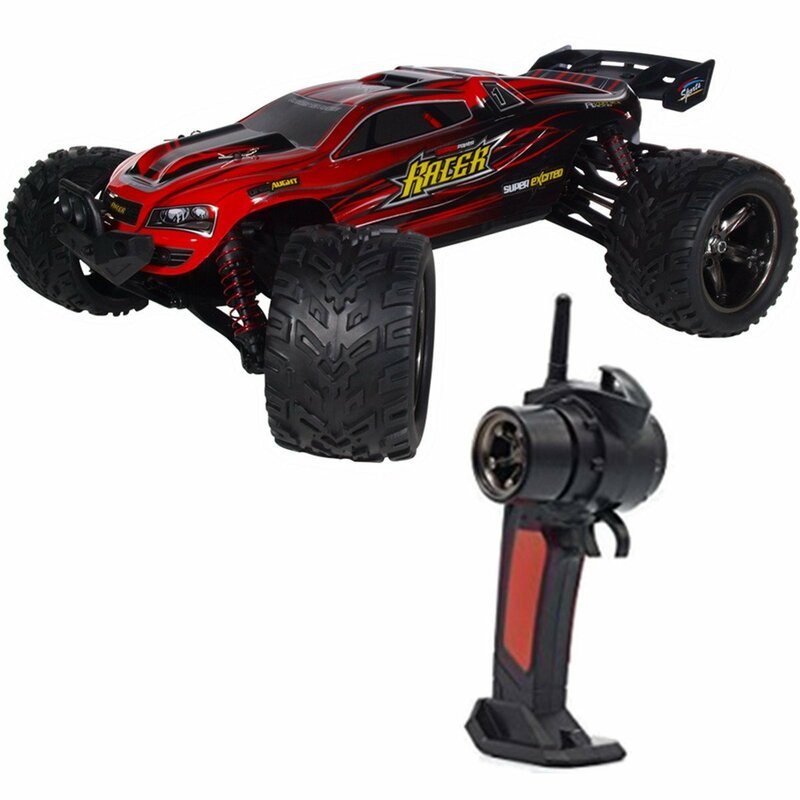 Speed/power – It is import to determine if this is for indoor or outdoor use, If indoors then speed is not necessarily important and not choosing the right RC Car can potentially cause a hazard. Outdoor use means different terrain and gradients along with obstacles where power comes in to play for traction and control. Range – Again this comes down to where the car is going to be used. Indoors does not require a huge range and is not so important. Outdoor is where it comes to play and if you are in large open spaces then you would like a bigger range for your kid to properly get stuck in and have fun with. Battery life – We all complain about having to charge our mobile phones and kids are no different. After all it’s not fun just sitting and staring at the thing. The real fun is for your kid to imagine being Lewis Hamilton tearing up the track with speed and awe-inspiring driving maneuvers, Or being the Stig and drifting round corners. Either way more time spent playing with the car is better rather than being stationary whilst charging. Some models come with detachable batteries that allow to simply swap over to have a more continuous and enjoyable experience. The Sommon Swift is a medium range RC built with speed in mind along with its high toughness explosion-proof PVC shell. This makes it ideal for off-road cross-country use as well as having a great range. A lot of fun can be had with this model due to is ability with dealing with cross-country and overcoming obstacles. The charging time is about 2 hours which can offer 40 minutes of playing which for an RC is pretty good. This RC represents the classic Porsche 918 Spyder. With the independent suspension it gives you compete control and enables you to guide through sharp turns and corner. It also comes with working lights and rubber grip tires to combine with an authentic detail of the real thing. All you need is 3 AA batteries for the vehicle and 3 AA batteries for the transmitter and you are good to go. Meaning no time is taken in charging any batteries. Also this is ideal for those on a budget with its relatively low price range. Although the distance range for this model is not the best. Like fast cars. Look no further. This has style, detail and is officially licensed with authentic badges. With full function radio control enables responsive steering allowing you to zip around corners like the legendary Michael Schumacher. Ideal for indoor use or outdoors on tarmac surface. This RC also comes in at an attractive price which will not damage the wallet. Although the distance range for this model is not the best. The Timiya RC racing fighter buggy is as fast and powerful as it looks. This impressive RC not only looks epic but delivers in speed, control and range. It’s tough design allows hassle-free assembly with nimble control perfect for off-road running and jumping. With its carefully chosen pin spike tires it knows no bounds. This is a high-end model and will come with a price but comes with an abundance of features that anyone would appreciate and make worth while. Two options available: Starter pack deal and racing pack deal (inc fast charger). Although relatively small in size in comparison to the rest, its tough body made of nylon composite material enables it to handle almost anything you through at it. Along with its reliable oil shocks it handles jumps and rugged terrain exceptional well with good speed. Plus it is waterproof which is always a bonus. Overall this is a middle range remote control truck at a very decent price in comparison to the more expensive models. This particular RC 4×4 truck is rated and recommended for 14 years and up, however, each manufacturer rates their products for different ages based entirely on their own discretion. The Sommon Swift that we reviewed above is actually MUCH faster than the ECX Ruckus, yet, Horizon have decided to set the recommended age at 14 years. But, the ECX Ruckus does have oil filled shock absorbers, so I believe that their decision to recommend this for older teens and above is due to the fact that younger children shouldn’t really be using products that contain car oil. However, it’s entirely up to you as the parent to decide what is and is not suitable for your kids. If you are playing with your child and they are constantly under your supervision while operating the truck, then you may decide that the ECX Ruckus is a good option. The Babrit F11 model is a great entry-level RC car for beginners which comes in the low-end in terms of price. But that does not compromise on speed or handling. It surprisingly packs a punch for what you pay. Certainly, its strengths are on speed, control, and its remarkable distance range and are well made to deal with most surfaces outdoor. The design of the model also allows it to be waterproof making it capable of dealing with most obstacles with relative ease. The battery life is certainly not its main strength which provides up to 10 mins play time on a full 120 mins charge time. But overall it’s an enjoyable RC for the price it costs and ease of use to operate and control. 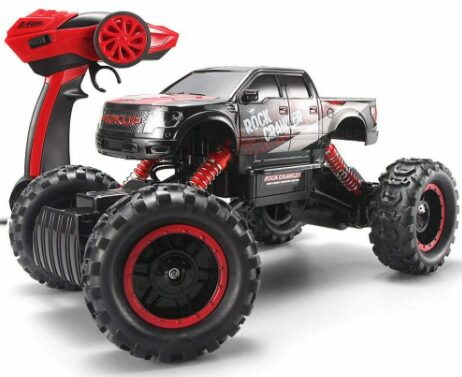 This particular RC truck is rated and recommended for 12 years and up, however, each manufacturer rates their products for different ages based entirely on their own discretion. Again, it’s entirely up to you as the parent to decide what is and is not suitable for your kids. If you are playing with your child and they are constantly under your supervision while operating the truck, then you may decide that the Barbrit F11 is a good option. So in general when considering purchasing an RC car it depends on how much you are prepared to pay, quality and durability, battery life, ease of use, range and speed along with much fun you will get out of it. The models we have reviewed bring different specification and as such bring different experiences at any level. Once you have decided what’s best for your 8 to 11 year old kid the fun begins. Happy driving. Children age and develop so fast, and what’s best for an 8 year old isn’t necessarily going to be a great option for your 11 year old. The difference between children at these age groups can be quite a lot, so I’ve highlighted some important points for you to consider when choosing a particular remote-controlled car for your little boy. By about 8 year olds, boys tend to be quite technically capable and are able to handle a more challenging car than a 5 or 6 year old would be able to. Obviously all children are different and what is a good option for one 8 year old child might be too complicated for another. But in general, you can choose a fairly advanced car for your 8 or 9 year old kid. A good bit more advanced than you would choose for a 5 to 6 year old for example. If you are worried about speed as some models can go really fast, then you can always look out for the speed limiter option. There can be a Training Mode option on the Electron Speed Controller (ESC) which when you select will reduce the speed to enable you to get used to the controls. This is ideal when first using your car and getting familiar with the controls. However not all models offer this. But there are still other options to help reduce speed. Such as changing the battery to a lower voltage. Less power means less speed. Again this depends on the model as not all batteries are changeable or advised under manufacturer’s guidelines. Another option would be to simply changing the tires. After all the 4 contact areas the model comes into contact with the surface is relatively small but very important and can affect the handling of the car. Larger tires would slow down the speed and also achieve better handling. Using knobbly/spiked tires or more tread would create more friction causing the same desired effect whilst also achieving better handling. The modification options are interesting if you wish to get a decent Remote Control Car that would provide the ability to adjust its speed to match your child’s handling. It can also be more fun. Otherwise it’s best to just look out for the specifications on what you want when purchasing the RC car at the beginning and then upgrade when the time comes. This could be more expensive in the long-term. Going on to the 10 and 11 year olds it is the same situation. They can be more capable with handling speed with control enabling them to use more powerful motors to get at faster speeds. Again with everything, it’s a judgement call as we all develop at different rates. But should be a little easier deciding what RC car to go for due to fewer restrictions being taken into consideration. On average most models are made available to ages of 8 years and up.